Many times we go to our local supermarket or farmer’s market to stock up on fresh vegetables. In a matter of a few days, lettuce can become wilted or worse…slimy. Here are five ways to keep your lettuce fresh for that delicious salad recipe you want to make for lunch or dinner. Tupperware Fridgesmart is a container that you can store your vegetables in and makes them last even longer. These containers have two special holes that you leave open or closed depending on the specific vegetable. Store your lettuce in the Tupperware Fridgesmart and you will be amazed how long your lettuce lasts! After washing your lettuce, shake the excess water off and lay the lettuce flat on a few paper towels. Place the wrapped lettuce in a Zip Lock plastic bag and the lettuce should last for the next 7-10 days. Just grab the lettuce when you need it! Using a metal pan to store your lettuce just speeds up “the spoiled lettuce” process. Be sure to use a plastic bag or container for storage. 4. Only buy the head! Bagged lettuce is sometimes already spoiled once it reaches the shelf. It has already be washed, cut and sealed. The lettuce is no longer preserved in its natural form. 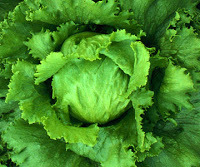 By buying a head of lettuce, it has been hydrated at the supermarket and is still preserved. All you would have to do is wash and store it yourself. 5. Use the crisper in your refrigerator. The crisper in your refrigerator is not for beer…it is for vegetables! Store your lettuce in the crisper and it will stay fresher. No more wilted or slimy lettuce. Try these tips next time you buy lettuce and you will surprised how long your lettuce lasts. This entry was posted in Food and Drink on December 24, 2013 by admin_z.